Timestream Software has released an update to their series of Notescasts for the iPhone and the iPod Touch, and I have been asked to review it. The Walt Disney World Notescast is a cool little app to have in your library! The beauty of the Notescasts is that they are not dependent on any network access at all! In their basic form, Notescasts are eReaders that you can have on your iPod Touch or iPhone, and once you have it installed, you can use it anywhere you want to without needing to look anything up over a network somewhere. The opening shot of the Walt Disney World Notescast is one of the most sought after photographs at Disney World: Cinderella Castle with fireworks going off in the background. The amount of information is really incredible, and reflects well on the level of detail that you have available at your fingertips. The really nice thing about this information is that it is written for all types of Disney visitors, whether they have a lot of knowledge about Disney or not. For example, there is a section specifically for Guests that have disabilities that need addressing. Another really neat thing about this Notescast is the incredible photography that is on display throughout the guide. The developers of the guide have done a wonderful job of capturing some of the best photographs I’ve seen. 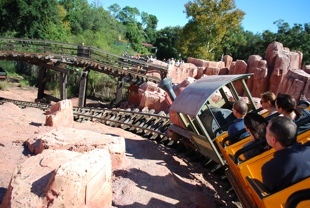 Some of their shots are even of views of an attraction while on the ride! They take pride in their work, and it shows in the details. Take a look at these photos they’ve taken of Big Thunder Mountain and Cinderella Castle during Wishes! Another great feature of the app is that there is a seamless integration between sections. 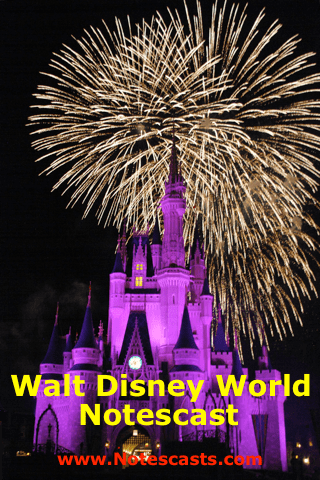 As an example, in the WDW Tips section, the reader is presented with several sub-sections, including “Walt Disney World Tips I”. If you tap on this section, there are a series of tips, one of which is referring to how you can cut down your time waiting in line by using FastPass. At this point, there is a link to read more about the FastPass. In fact, the only downside that I have found with this app is the way that it has handled the closing of Mickey’s Toontown Fair in February. Unfortunately, the app talks about how Mickey’s Country House and Minnie’s Country House will be closing due to the Fantasyland expansion, and it talks in great detail under the “WDW What’s Coming” section about the expansion, but no where that I was able to find did it actually talk about the fact that Mickey’s Toontown Fair is closing. However, one of the bonuses of the app is that you can communicate your comments directly to the developers via an email address, and they use those comments to help make the app better for the next release! This app, at $3.99, is extremely well priced in my opinion, and is a welcome addition to my library of Disney apps for my iPod Touch. I highly recommend this app to anyone with an iPhone or iPod Touch! Next week I will be talking about another Timestream Notescast: Walt Disney World Secrets Gold!